Rajiv Bhawan, the office of the state Congress, wore a festive look Wednesday as Sheila Dikshit took charge as the party's Delhi chief in presence of a large gathering of workers and senior leaders. However, the celebrations were marred as controversy erupted over the presence of Jagdish Tytler, an accused in the 1984 anti-Sikh riots, at the event. Three new working presidents -- Devender Yadav, Haroon Yusuf and Rajesh Lilothia -- also took charge along with Dikshit. The enthused workers greeted the former Delhi chief minister as she reached the office at DDU Marg with slogans and drum beats. Chants like "Sheila Dikshit Ayi Hai, Badlaw Ki Andhi Layi Hai" "(Sheila Dikshit has come with a storm of change) were heard. With Dikshit at the helm of affairs, the party is looking to revive its fortunes in the national capital after a series of poll debacles starting with losing of power in 2013. Dikshit said she will take the party to new heights in Delhi where it will replace all and sought help of ground-level workers. 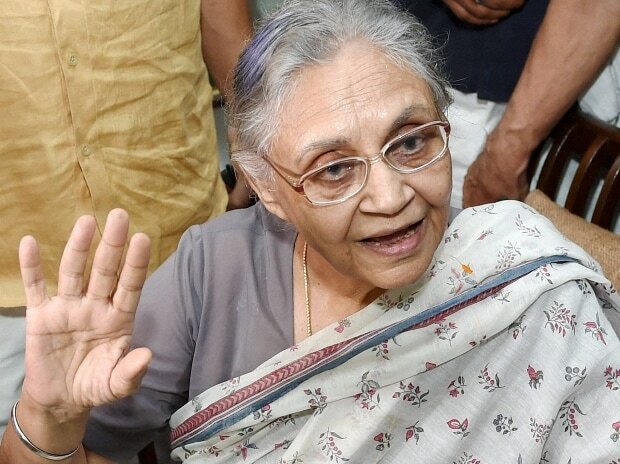 She also said the Congress will make full efforts to win all the seven Lok Sabha seats in Delhi. Senior Congress leaders Karan Singh, Janardan Dwivedi, Meira Kumar, PC Chacko, Sandip Dikshit and Ajay Maken were among those present as Dikshit took charge. Just before taking charge as DPCC president, she said no talks have been held yet on forging an alliance with the Aam Aadmi Party (AAP) for the upcoming Lok Sabha elections. "Politics is full of challenges, we will strategise accordingly. The BJP and AAP both are a challenge; we will meet the challenges together. There is nothing on an alliance with AAP yet," she told ANI. Sources in both AAP and Congress, however, claimed that chances of forging an alliance for the upcoming polls have emerged with the appointment of Dikshit. The change of guard in Delhi Congress assumes significance as the party is gearing up to brighten its fortunes in the upcoming Lok Sabha polls, considering that the BJP had bagged all the seven seats at stake in the capital in the last general elections.